Now dear horrorfiends i know this one might seem like a cheat since this film just came out two weeks ago, but lets face it normal movie viewers are not going to know about this film so technically it can count as a Hidden Horror. 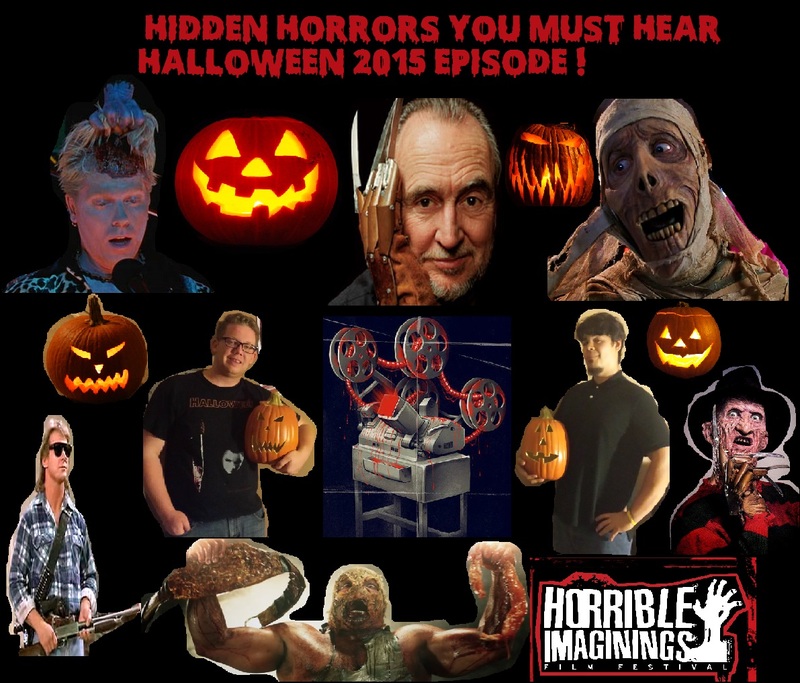 And not just a Hidden Horror but a Hidden Halloween gem horror fans should seriously check out for this Halloween season and make it a annual viewing every October, It is the Canadian made demonic Trick or Treater movie HELLIONS. 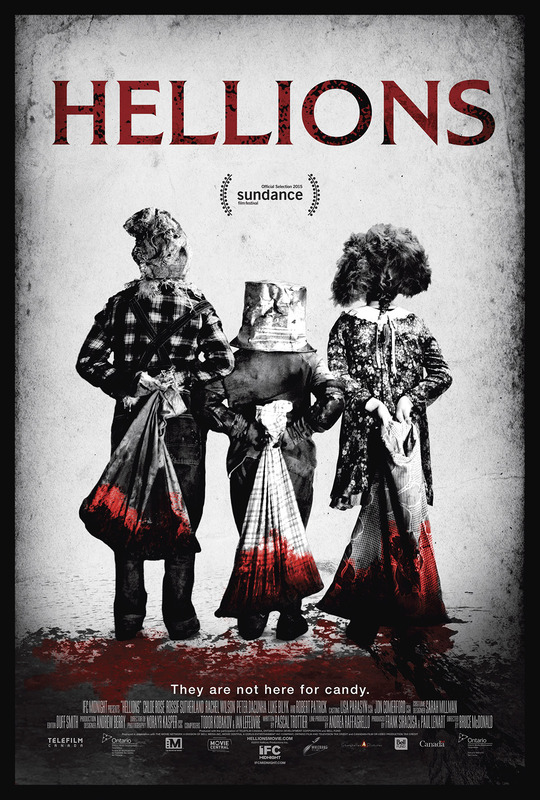 Hellions is about a teenage girl named Dora on Halloween during a blood moon who lives in a town famous for his Pumpkin Patch and discovers that she is pregnant and soon finds everyself being terrorized by creepy, demonic Trick or Treaters who want her unborn baby. This film is Bruce McDonalds return to Horror after his incredibly cerebral zombie film “PontyPool” back in 2009. And boy i can say Bruce McDonald has not lost it. The character of Dora is a very rootable character and you denuinely dont want to see her in any peril, so when the trick or treaters attack it can be very tense. The demonic trick or treaters manage to be creepy, incredibly menacing and nightmarish all at the same time. the film also adopts a surrealistic tone to the terror as soon as the trick or treaters attack. As soon as the terror begins the film adopts a pinkish-red color correction throughout the rest of the movie, almost suggesting a sense of surrealism is not adopted the area our poor Dora is in. But as the terror progresses more odd and surreal things begin to happen making the viewer question if everything truly is happening to Dora. Happy Cinco De Mayo horror fiends! a day which white people try to be mexican and to mexicans its just another day. Now if you are looking for a mexican horror movie but dont want anything with mexican wrestlers and want something a little more gory and ghoulish then ive got just the obscure mexican horror movie for you. 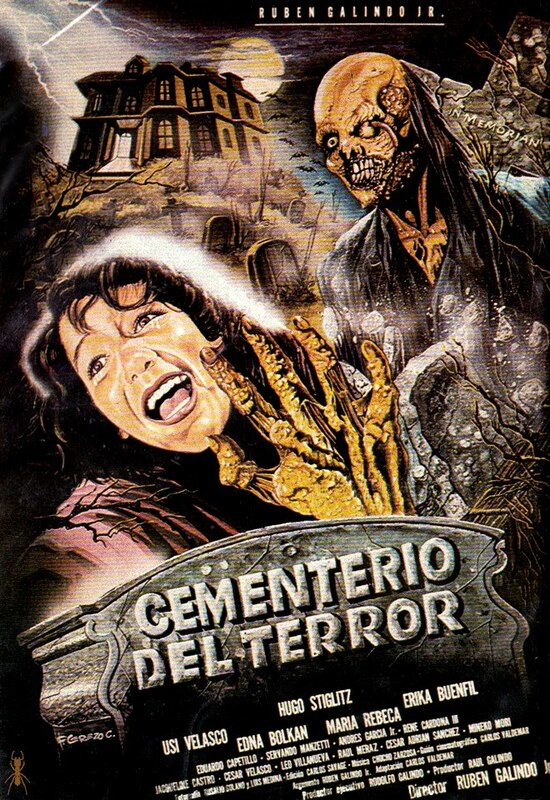 A “hidden horror” that is hardly talked about even in the horror community, it is the 1985 slasher-haunted House and cemetery zombie hybrid film “CEMENTERIO DEL TERROR” or Cemetery of Terror in english. from IMDB: A professor suspects that a vicious killer may have discovered a way to return from the grave and continue his violent spree. His fears are proved true when a group of teenagers decide to pull a Halloween prank by stealing the killer’s body from the morgue. When the teens recite an incantation from an old magic book over the corpse, it begins to come back to life, along with all of the bodies from the nearby cemetery.All the while three children trick or treating are terrorized by all the bodies that have now risen in the nearby cemetery.